I typically don’t care for technology at the table. It tends to distract my players from the game at hand and I personally find myself checking my Twitter account for what’s going on when I should be running a fine adventure. Considering my feelings on having a Tablet, Smartphone, or Laptop on hand at the table I was initially hesitant to endear myself to the whispers of the Digital Tool for Dungeons & Dragons that showed up on the social media scene under the moniker of “Codename: Morningstar” from this company I’d never heard of, Trapdoor Technologies. You may recall my initial post on the subject where I essentially ran down the list of my suspicions of what it might be like and how I felt it may measure up the D&D Digital Tools I was most familiar with, the fairly good 4th Edition fare we were able to rent monthly through having a D&D Insider account. After posting my thoughts I spent a little time reading their blog and paying attention to the social media marketing I warmed up to the idea enough to muster some interest in what it would be like. Well, it appears they thought my ramblings and wild theories to be more dangerous than giving me the straight dope because, against all better judgment, the good people of Trapdoor Technologies invited myself and a few others to an exclusive Press Invitational to kick off Gencon and help reveal themselves a little to us all. I arrived somewhat early, considering some painful Indy traffic, and was met by three members of the Trapdoor Technologies team, Evan Newton, handled the bulk of the web presentation, Rachael Bowen, the team’s Community/Support Manager, and Chris Matney, the Managing Director. It was easy to see early on that these three were very invested in presenting a labor of love, not just something that would eventually be sale-able. This was a project near and dear to them, and no one more than Chris. 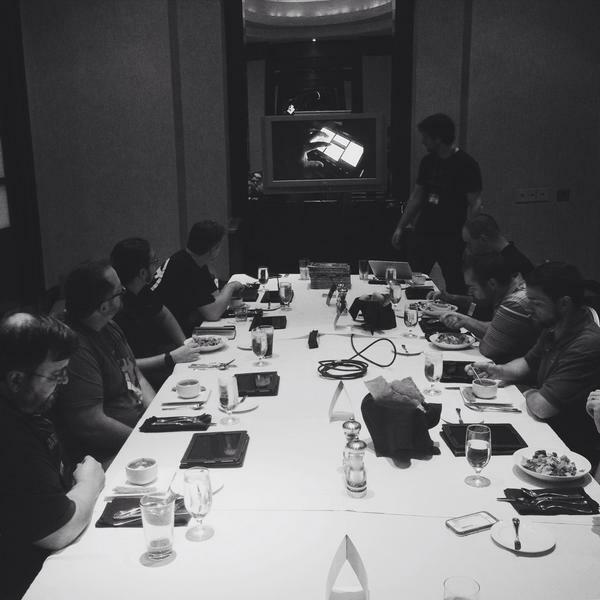 We had some meet and greet time and then launched into the Web Presentation run by Evan. Right away we discovered that the name “Morningstar” was to change, and as many likely already know we learned it was to be called “DungeonScape”. I have to say that beyond being an apt name for the tool it also happens to reference one of my favorite D&D 3.5 supplements, so points for them! It’s not just “An Essential Guide to Dungeon Adventuring” anymore! 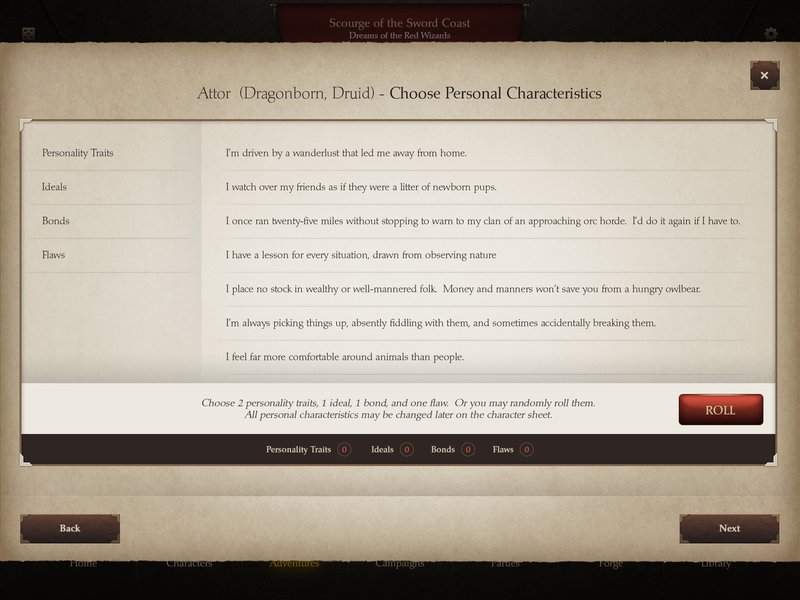 The Player’s Release: Which will cover Character Creation and management including full use of the library search capabilities for books currently available. The Creator’s Release: All the customization, The Forge. 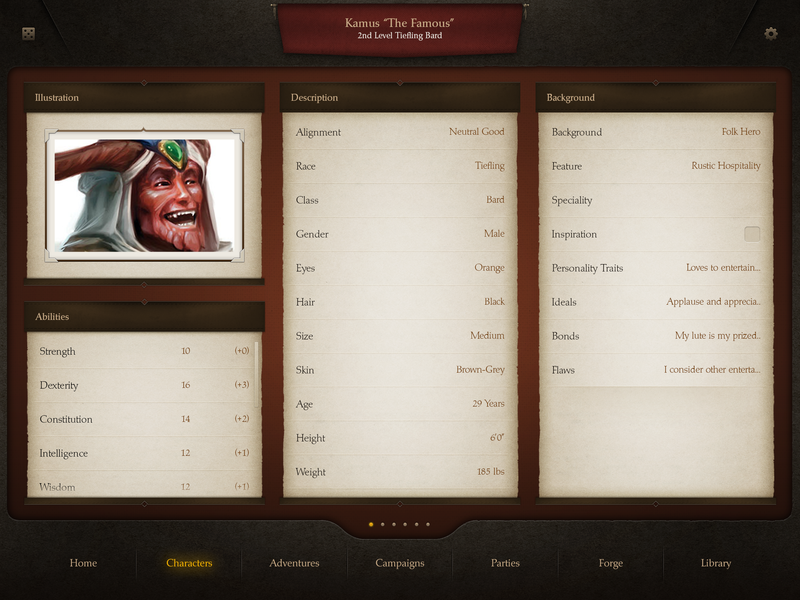 First we were introduced to Character Creation, by far the most fleshed out portion of the app. The entire Players Handbook has been integrated into the system so we were shown the full list of options available to date from the 5th Edition Set of D&D rules. Creation was fast and would require little outside guidance for anyone familiar with the options laid out in the physical book. Actually, I only just today purchased my Players Handbook so it seems anyone with any D&D familiarity can easily navigate creation. It was here that I first noticed that the layout of the tool, though on a tablet for the event, definitely appears to have Smartphone users in mind as well. Everything menu or graphic during the creation of a character, or post creation, can be is viewed on vertical rectangles that will obviously later be entire screens on a Smartphone to be easily flipped about. It will be a lot of screens for someone not on a Tablet or Laptop but each one will be rich and functional. During the creation process you never feel truly led by the hand, it just flows naturally. Stat options include Point buy, Rolling, or entering of the numbers. 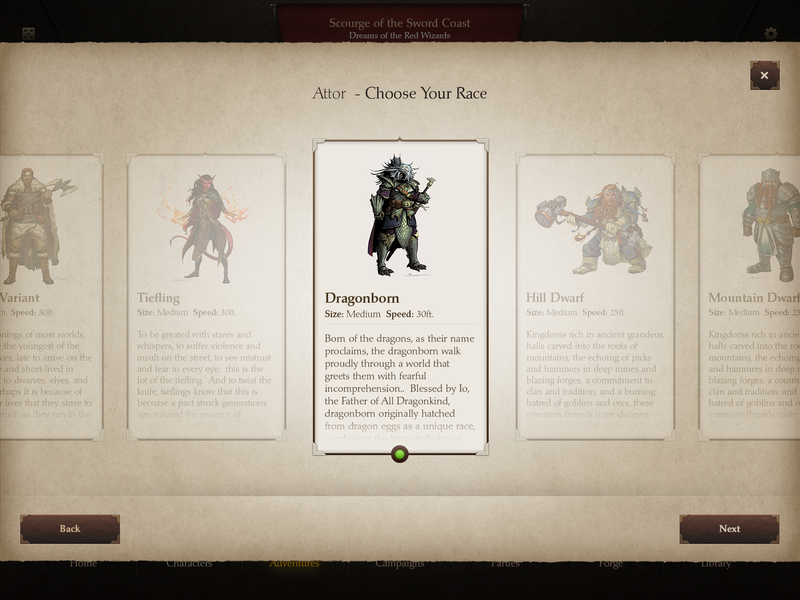 The selection of skills, spell choices, or feats are step by step and interact seamlessly with process by changing the character’s stats as affected. There aren’t a bunch of dropdowns for things like Gender, age, or weight you’re allowed to write in what you want or roll randomly in some instances. It basically becomes a quicker way to fill out a character sheet. You’ll get three categories on screen and can flip between six pages. By “pinching” (is that a technical term?) the screen you will back out and be able to rearrange where you want the categories to be laid out on the pages. This is a nice feature, say you run a fighter and don’t need those categories related to spells just push those to the back of the line to never be used. If you have a question on how a certain stat came to be the number it is tap it and a breakdown of the affecting items\proficiencies will be brought up for you. All throughout there are a ton of small considerations like this that I love to see. More character gen items, the DM stuff isn’t quite ready. This portion of the presentation was the most impressive to me. I have seen well crafted character creation engines in the past, many freely available, but tools to assist the DM have been far more lacking. Granted you have things out there like Roll20, but those are aimed at assisting with an online game and Chris was quick to point out that DungeonScape is to be more of a quick\compact reference aid than something that goes too far toward running the game for the DM. This was stressed, it’s a tool but not a video game. You can even reference this piece from their blog where they go even further into discussion Automation vs. Customization. So it is plain to see that while the DM’s Release is going to provide all the tools a DM needs to run his game, the DM is still running things. A great example commonly referenced goes thusly “The DM rolls for and informs a player how much damage they receive and the player follows by entering that deduction of Hit Points from their total. The game doesn’t roll and apply damage for you.” I really like this, obviously, because if I wanted a video game RPG, they are widely available. I would like to see this as a possible option in the future perhaps, mainly for online play, but for now what I want to see is exactly what’s been laid out. The DM’s tools might be useable by Smartphone, but I doubt they would function nearly as well. You have large screens with your notes and story, coupled with as many hyperlinks to maps, NPC’s, and Encounters as you wish to add. Bookmarks can be placed within the notes for quick returns to a page and there is even the ability to add annotations if you need to remember something, like maybe the tavern in “such and such town” was burned down by the PC’s and returning to that town could be trouble! The thing is, these screens are mostly larger so a Smartphone wouldn’t be the best bet for usage here. Still, even with that (perceived, I could easily be wrong) limitation I’ve not seen a better set of DM’s tools ever. You could easily run a game from your Tablet or Laptop, needing little else. A neat feature of the DM’s set of tools lies with the fact that published adventures will download to the tool fully fleshed out and beautiful but if we’re to be honest most DM’s out there love to craft our own stuff. This is where the Creator’s Release comes in, and I think this portion will make or break my interest in this project. Sadly, as the third and final release, it was the part of the project we saw the least of but there were assurances made and a few kernels of possibility that certainly peaked my attention. 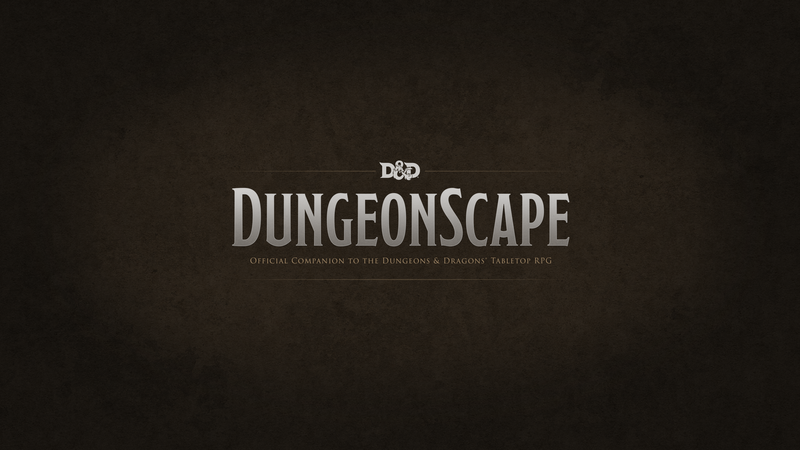 One of the best parts of the 4th edition D&D digital tools was the Encounter Generator and DungeonScape stands to be every bit as good or better when it comes to creating your own enemies and encounters. That customization of creatures will be one an even more micro basis and your custom enemies will save in your account for future grabbing, you will know they are custom but their stats appear in the system looking just like any other creatures. In fact, there is little that is left out of the promised customization availability and I can’t wait to see how it works out. The network will be cloud based, this way it won’t matter what manner of tech you use to access your account it will work seamlessly with the rest of the table’s chosen devices. The DM will be able to communicate to players through the app and can even send secret messages. Awards, akin to achievements, will be awarded to players of official WOTC events like the ones at Gencon, or Adventurer’s League that will stay with the player’s account. I have to say I’m impressed, I’ve never really wanted to have a tablet to run things from but they are making it very enticing. I may have to give it a try. There is a danger with creating a tool like this to just hire a tech guru to flesh something serviceable out so the company can say “Yeah, we’ve got digital tools…sure” or worse yet just have someone in house code something up so again something is out there. While there were many things good about the 4th edition digital tools there was nothing like this, this is something special. It all comes back to Chris Matney. I said it above, everyone attached to the project seems in for the sake of the game but no one more than Chris. I meant this. Chris has been playing D&D and other RPG’s for longer than I’ve been alive and when he says this is a something he’s always wanted to do with D&D there is an earnest truth behind his words. He is fully immersed into making this the perfect additive to the game, not a distraction and not something that runs the game for you. When he ran us through his game at the end of the night I became a believer too. Once the wow factor subsided I was as involved with the game on the table as I would be as a player in any pen and paper exclusive game. Not to mention I envied the fact he could pace the room, moving in amongst us to add further suspense. All while keeping a natural DM’s screen handy in his hands. You have my attention DungeonScape, I look forward to trying you out in Beta and beyond. This entry was posted in Dungeons and Dragons, Dungeonscape, Game Review, Gaming, Gencon, Random Geekery by Kevin Smith(@SharnDM). Bookmark the permalink. Very awesome. Really glad to see such an emphasis on helping DMs run their games. I’m so hyped, can’t wait til the beta. It’s like I said, that’s going to make or break it for me. I’m not nearly as interested in the Player Character stuff, (which works fine but I like my paper there) as I am in having everything I need on one device easily reachable by hyperlinks! Do we have pricing info yet? Eg, Will it be once-off or subscription? Will the DMs & players modules be available separately? You think like me, pricing was one of my first questions even though I knew what the answer would likely be. That being: “We aren’t ready yet to discuss how the pricing will work.”. Honestly, I get that completely. To answer your second question, from all appearances they’ll be providing it as a full package. The layout appears to be one full system with tabs along the bottom. It doesn’t look more modular than that. Great write up, you have me really wanting to try this! Just a quick question, and apologies if i missed this in your write up, but is there an option to print stuff? specifically generated characters? This was the feature our group used most from the 4e toolset. There were hints that player character sheets may be printable but they didn’t demonstrate anything like that, they may also have only mentioned that it was a good idea. I think the biggest takeaway here is that they are very community driven and WILL listen and take to heart requested features. Hit them up and you will almost certainly get a response on any questions you may have. Hopefully when I purchase a dead tree version of an adventure, I’ll be able to redeem a code to have it in DungeonScape as well. Glad things are looking positive, i’ve been holding off on Realm Works until this shakes out. Does anyone know when this is actually being released? We were told to expect the full product within the 2014 year.